Today is "Z" day! That's right the final day of the Blogging from A to Z April Challenge of 2015. Now this is not the last recipe I'll ever post this year but it is the last of the recipe posts for April 2015. What a way to end the challenge then with zesty pasta dish that is full of flavor and only takes about 30 minutes to prepare. 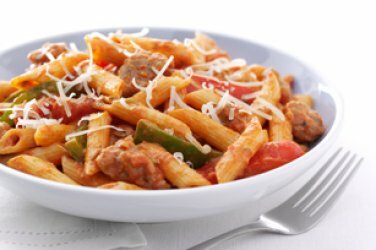 So if you like penne pasta, sausage, peppers, and a zest red sauce then this is the perfect meal for you! COOK pasta as directed on package. MEANWHILE, crumble sausage into large skillet; cook and stir on medium heat 8 min. or until done. Drain. Add peppers; cook and stir 5 min. or until crisp-tender. Stir in next 3 ingredients; cook 5 min. or until heated through. Add cream cheese; cook 2 min. or until melted, stirring frequently. DRAIN pasta. Add to sausage mixture; mix lightly. Top with Parmesan. Prepare using PHILADELPHIA Neufchatel Cheese or 1/2 cup (1/2 of 8-oz. tub) PHILADELPHIA 1/3 Less Fat than Cream Cheese.